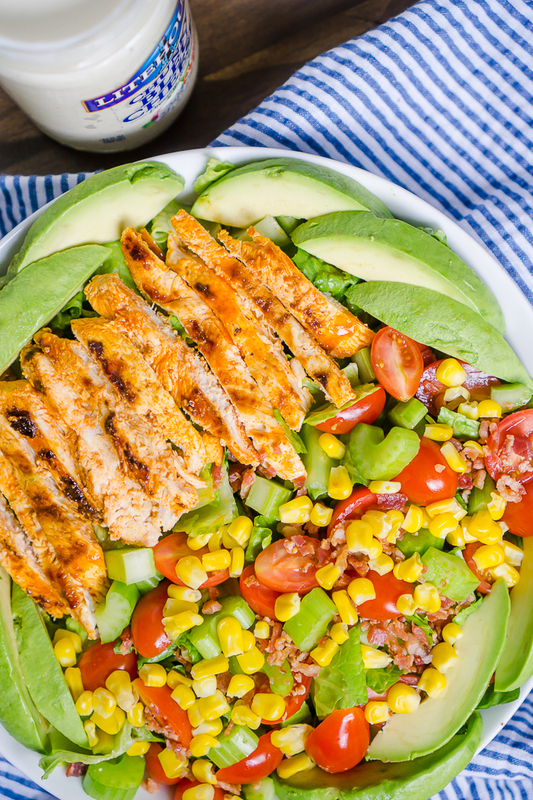 Buffalo Chicken Salad is a hearty and delicious salad with all the fixings! Perfect to prep for lunches and filling enough for even my husband to enjoy for a summer dinner idea! 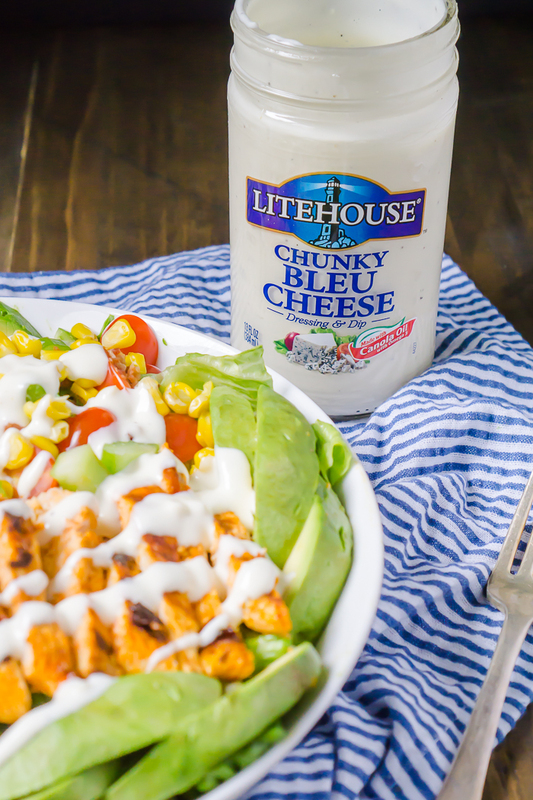 Buffalo Chicken Salad with Litehouse Chunky Bleu Cheese Dressing is the perfect summer salad! We have officially entered into warm, beautiful weather here which means it’s definitely salad season. 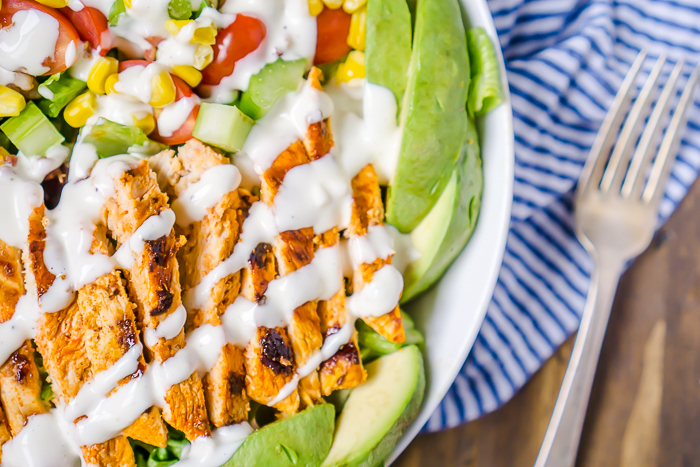 I try to have salads most days of the week for lunch which can be boring if I don’t properly plan on some tasty salads like this Buffalo Chicken Salad with Chunky Bleu Cheese Dressing. This is a salad I can even get Bryan to eat for dinner because it is filled with so much yummy goodness that the salad is really filler! For this salad, I marinate chicken in buffalo sauce for at least an hour and sometimes over night and then quickly cook it on the skillet. If you like having salads for lunch or leftovers like I do, make sure to cook a couple chicken breasts so you can cut them into strips once cooked and save in the fridge for later. After that, I add fresh corn, tomatoes, avocado, lettuce, and celery. Plus I add in a few different toppings I love now and then to switch it up like crumbled bacon, red bell pepper, cucumbers, etc. 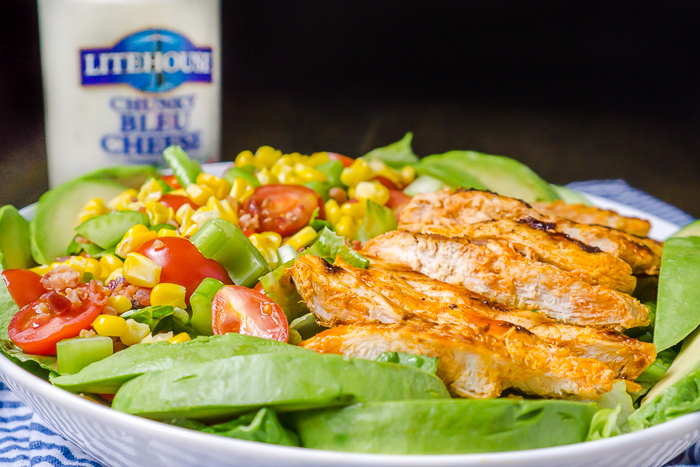 The emphasis though if mainly on fresh ingredients, which is why I love Litehouse Chunky Bleu Cheese Dressing. You can find it in the refrigerated produce section with the other fresh salad ingredients because they emphasize fresh ingredients. Now, I have always had a slight love/hate relationship with bleu cheese. As a crumbled topping, it has to be really light for me to enjoy or I feel like the salad gets overpowered. Dressings have been hit and miss … until this one! Bryan can totally confirm this for you all but I am obsessed with Litehouse Chunky Bleu Cheese Dressing. Even he, who is NOT a bleu cheese fan, enjoyed his salad with this dressing as the finishing touch. 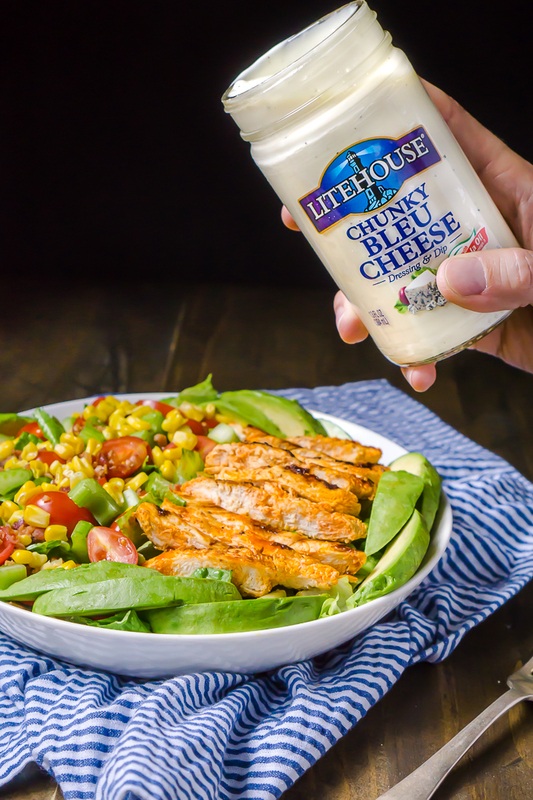 The Litehouse Chunky Bleu Cheese Dressing offers such a smooth, light bleu cheese flavor that pairs perfectly with the buffalo chicken. 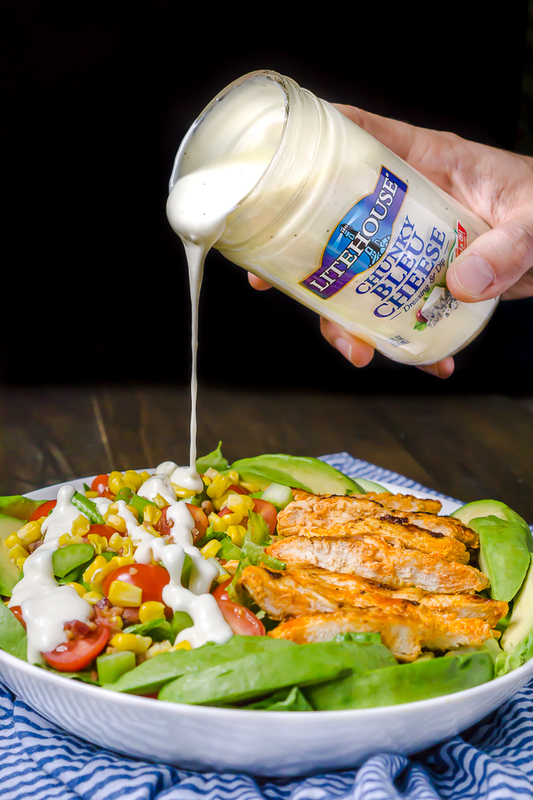 You need to give it a try so make your way over to the Litehouse website where you can use product locator for this dressing and check out their other products. While you’re there, make sure to sign up for their newsletter to receive access to a coupon you can use! Put chicken and buffalo sauce in ziploc bag and marinate for at least 30 minutes or up to overnight. Heat oil in a 12-inch pan over medium-low until oil shimmers. Add chicken. Cook, without moving, for 9 minutes or until smooth side is pale golden brown and the chicken easily releases from pan. Turn chicken; cook another 5 minutes or until your meat thermometer says your chicken is properly cooked. Remove pan from heat and let chicken stand in the pan for at least ten minutes. If you are not hoping for leftovers, add all of the salad ingredients to a large bowl. 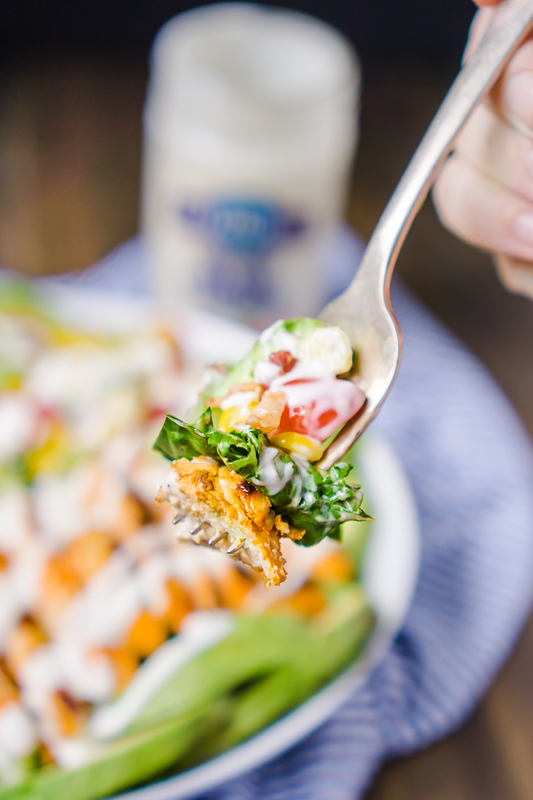 Drizzle with your desired amount of Litehouse Chunky Bleu Cheese Dressing and toss to combine. If you are hoping to have leftovers, toss all of the salad ingredient together in a large bowl except avocados and dressing. This would be a great salad to prep for work in individual servings. Just add dressing and avocado when you're ready to enjoy!